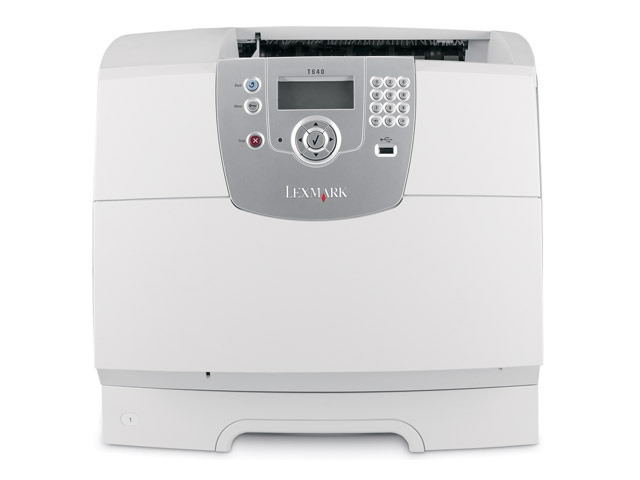 Achieve professional results fast with the Lexmark T640, an affordable mono printer robust enough to handle the high-volume output requirements of your busy workgroup. Equipped with a USB direct interface, the T640’s userfriendly operating panel gives you PC-free printing of PDF, JPG, TIFF files and many other document types(1). Plus, its numeric pad with 4-line display coaches users through printing and maintenance functions with ease. With its sleek new design and very low acoustics, the T640 integrates seamlessly into your professional environment. And when you need big results, you can count on its outstanding print quality, powerful performance and lightning-fast time to first page of only 6 seconds! Focus on your core business and leave the printing to Lexmark. Reliable and very robust, the T640 requires minimal intervention. Best of all, it comes with Lexmark's worry-free on site repair guarantee of one year.